Reviewing anything interesting in comics. Caveat: I'm a fan of Walt Simonson, so this'll probably end up being a fairly biased piece. He's been a part of some of my favorite comics, starting with Marvel's old school Star Wars book, through the classic 1980s X-Factor and latter day works like Judas Coin (which I say very nice things about right here). A fine resume to be certain, but arguably Simonson's finest work is his epic run on Marvel's Thor. 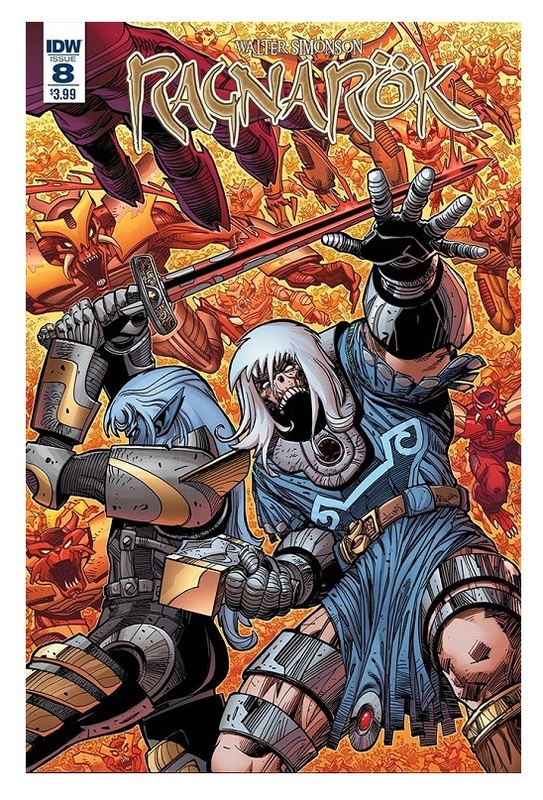 In addition to gracing readership with creations like Malekith, Beta Ray Bill, Skurge with a machine gun, and Frog Thor, that particular stretch of comics spotlighted how adept a storyteller Walt Simonson is. 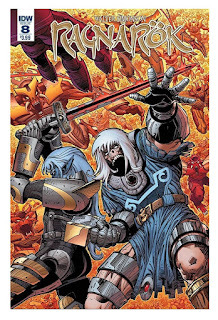 IDW is doing The Allfather's work in bringing us Walt Simonson's Ragnarok, which spins the tale of undead Thor in the ruins of Asgard after the Norse apocalypse. If that hook doesn't sell you on this book, you must hate fun because this comic is a nonstop action-packed thrill ride. The main character is undead Thor. Ragnarok's eighth issue is fairly well filled with pages of Thor and Regn,a dark elf, beset upon, and slaying with gratuitous violence, hordes of demons in the service of Surtr. Intermingled with gloriously illustrated pages of Thor and Regn destroying fire warriors the two have a discourse revolving around Thor murdering Regn's daughter and his subsequent vengeance. The two agree to an archetypal uneasy alliance in order to defeat the legions of Muspelheim with the promise of Regn getting a free shot at Thor after the fact with his god-slaying sword. Guys writing for Heavy Metal in the '80s woulda killed for this sort of material. Although this issue is almost wholly dedicated to a phenomenal fight, there are a handful of great character moments between Thor and Regn that illustrates the relationship between the two. Which I predict will turn into some sort of Viking buddy cop scenario . . . This comic is phenomenal, ladies and gentlemen. The story is rock solid, the art is beautiful and the colors vibrant and brilliant. Issue 8 opens with a full-pager depicting Mjollnir bursting towards the reader, and that's a pretty decent analogy for the series so far. It came flyin' outta nowhere and smacks you in the jaw with a mix of mythological know-how and classic comic action. You can almost make this a spiritual successor to Simonson's Thor run at Marvel if you're inclined, but it stands tall enough on its own. Also, they ride around on horse creatures that kinda look like the one Ookla had on Thundarr the Barbarian. That in and of itself should be more than enough incentive to check it out.